« What Actually Is The NBN Objective? There has been a lot of talk today about a campaign launched by Melbourne’s 13CABS – (a co-operative consisting of Yellow Cabs, Black Cabs, and a number of other smaller depots) – with respect to a recent taxi industry review, one recommendation of which has been the proposal to introduce unmarked, London-style “mini-cabs” into the Melbourne market. 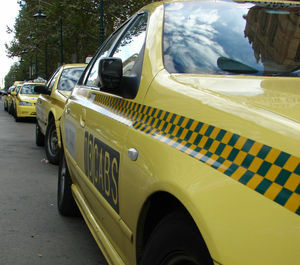 The campaign has come under particular criticism due to using the same “scare tactics” that were used in London to warn people of the potential dangers of unmarked “taxis”, highlighting a possible increase in sexual assaults by drivers. The problem could be very real. In an unmarked, unlicensed “taxi” – how do you know who is driving you home? Is there a security camera in the vehicle? If something does happen, who do you report it to? Does the vehicle have GPS tracking so that authorities can find it? How will you identify the vehicle you were in? How do you know the number plates on the vehicle are legitimate and not stolen to hide the identity of the vehicle? Would you want to be under the influence of a good night out, and have absolutely zero knowledge of who is driving you home? Granted, there are a lot of dodgy drivers in legitimate taxis, but you at least have the chance to identify the vehicle, and have the company track it on GPS if something were to happen. These should be your safety concerns with the “mini-cab” proposal. 13CABS are trying also to promote the fact that extra “taxis” on the road will reduce already very low driver incomes – and this is quite correct. Say for example there are 120,000 taxi dispatches in Melbourne on a busy Saturday night. The approximately 3,500 taxis on the road in Melbourne would get on average around 34 of those jobs each. Lets say the average fare is around $20.00. A taxi working the roads properly would put around $685.00 on the meter for the evening. It’s hard work, but it can be done. Further suppose that 1,000 extra taxis were put on the road. Instead of getting 34 jobs each, they are getting 26 jobs. The average fare isn’t going to change. Instead of putting $685.00 on the meter, the cab is only going to put around $520.00 on the meter. That’s $160.00 less, of which the driver would have gotten $80.00. Ask yourself if you would like your boss to pay you $80.00 less a day? So 13CABS is absolutely right to campaign on behalf of all its owners and drivers, against the proposal. Where 13CABS is absolutely wrong is to use a campaign of scaring people with claims of increased sexual assault, with a confronting leaflet that would scare many people, and particularly women. It’s despicable. Instead, they should be explaining the problem like I have described it above – in terms everyone would understand. They shouldn’t be risking scaring away the people they’re trying to look after at all times of the day and night, just to make a point that could be made far more openly and honestly. It is a disgusting attempt to get publicity for their entirely reasonable campaign, and they should hang their heads in shame. A simple safety tip for any cab ride is to take note of the cab number – (on the doors, on the number plates, and on the dashboard inside the vehicle) – and key it into your mobile phone for future reference. That way if something happens, you have some information which the police and the taxi company can use to start their investigation with. In an unmarked “mini-cab”, you’ll have no such thing.